Hence, something I wrote four years ago that I find just as relevant today whenever an official of the U.S. Government, civilian or military, opens his or her mouth to speak about something or other while saying nothing about anything. Michael Murry, “The Misfortune Teller,” Copyright 2010. 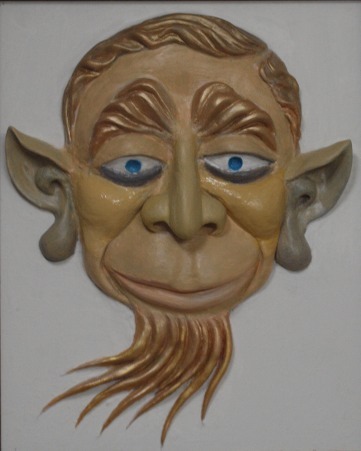 Michael Murry is a Vietnam Veteran, gargoyle sculptor, and poet. He occupies the Asian Desk for The Contrary Perspective. Bravo, Mike, for a rhyme of “Southeast Asia” with “euthanasia”! The current US air war has turned to bombing crude oil facilities in territory seized by IS. Well, that’s brilliant, eh? Destroy the commodity the modern world is most dependent on, the one whose copious presence under Iraq’s soil brought this whole sordid situation about! The price of crude had been slipping of late, to the low-US$90s for West Texas Intermediate, and even Brent had slipped below a hundred bucks the barrel. Exxon/Mobil, et al., were doubtless concerned about that. What better way to drive the price of a commodity higher than to reduce the supply? Send it up in flames, pollute the planet some more, increase the corporate bottom line. I saw the headline for an opinion piece the other day, suggesting that Obama is the most “extreme” POTUS in history in terms of curtailing our civil liberties here at home. I imagine this was penned by a “Libertarian,” but it purported to reflect results of a poll of Constitutional Law experts. They seem to have forgotten that Lincoln pretty well suspended civil liberties within the Union during the Civil War. Therefore I would argue Obama only rates near the top of the list by dint of the technological advances that allow the government to insert its tentacles into almost every aspect of our lives. A more extensive surveillance, but not quite as intensive. Not yet, at least. How I wish that President Obama had brought along Colin Powell, George Tenet, and John Negroponte to sit behind him in silent witness as he gave one of the most transparently deceitful presentations ever to disgrace the United States and that assembly of world governments. Why the Russian delegation did not just get up and walk out in the face of such gratuitous and slanderous insults, I cannot understand.